The Siege – Did You See That One? The war on terror seems to come to New York after the United States government secretly abduct a terrorist leader named Sheikh Ahmed bin Talal. After a series of attacks on U.S. citizens, F.B.I. Agent Anthony Hubbard (Washington) is on the offensive, looking to prevent any further attacks. Along the way he’s forced to contend with the C.I.A. and agent Elise Kraft (Bening), who continues to withhold information on the people responsible for the attacks. Meanwhile, the U.S. military is beginning to plan for their own offensive against the terrorists. Major General Devereaux (Willis) is prepared to bring the military to New York in full force, in an effort to stop the violence. As these three fight their own battles, the question of trust rests heavily on their minds. To prevent more death, they’re going to have to decide who is fighting with them, and who isn’t. This film is the creation of Edward Zwick, Lawrence Wright, and Menno Meyjes. Oscar-winner Edward Zwick (Shakespeare in Love) not only directed this film, but also assisted in writing the screenplay. Wright (My Trip to Al-Qaeda) developed the story in addition to his contributions to the screenplay. Meyjes (The Color Purple), an Oscar-nominated writer, also contributed to the final screenplay. The cast features a number of award-winning actors as well. Oscar winner Denzel Washington (Safe House) leads a cast including Oscar nominee Annette Bening (Open Range). The cast also includes Golden Globe winners Bruce Willis (Looper) and Tony Shalhoub (Cars). This story is an interesting pre-9/11 take on terrorism in America. The intense moments of the film play out nicely, with suspense built into every aspect of the screenplay. Unfortunately, the contrast between these moments and the more calm segments of the film is too obvious. This unfortunately hurts the pace of the movie overall. This story, despite many great moments, is a victim of a need to be complex. That need unfortunately hurts the clarity of the film and leaves it feeling jumbled. Still, this is a decent story despite the flaws. The acting in this movie is really good, not only from the stars, but from a number of supporting players as well. 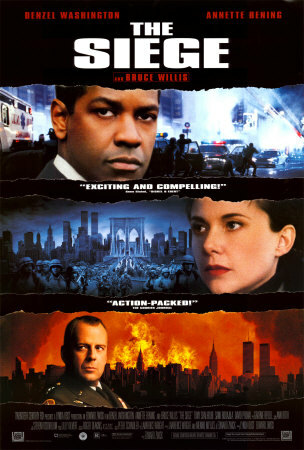 Having Denzel Washington, Annette Bening, and Bruce Willis lead the way is great. Each of them bring their own skills to this film in nice performances. Additionally, Tony Shalhoub is really good in this movie. Overall, the acting makes the very best of the screenplay, likely bringing the story up a notch. The other actors in this movie also do great work with the supporting roles in this film. The visual aspects of this movie are pretty good. The special effects bring the reality of terrorism to life. This aspect of the movie had to be good, avoiding doing too much or too little to make the point. The set design and location choices were also really good. Overall, this film does all the right things from the technical side. That being said, the movie doesn’t break any new ground or do anything overly special. Adding to the movie is a decent score from composer Graeme Revell (The Crow). This film does a lot of things right. The visuals, the music, and the acting all seem to do their part in this one. Unfortunately, the overall execution of the film suffers from a confusing screenplay. This doesn’t kill the movie, but it definitely seems to give it a slower pace. The story also seems to require more patience than a thriller like this should need. Overall, this is a good movie for fans of the stars. I would also suggest this to anyone who enjoys thrillers. I give this one 3.2 out of 5 stars. Alright, go ahead and vote me off the island because I have never seen this one (to my own surprise as well). Given the cast and plot I’ll have to check it out. I also wanted to inform you that I mentioned you in a blog post today. A fellow blogger nominated me for the Liebster Award. It’s a blogger to blogger award expressing our enthusiasm for the blogs we follow. (Yeah, I just learned that today) Anyway, I “nominated” you in my post, mentioning that I enjoy your reviews. Feel free to check out the post here, http://abstracticality.com/2014/07/28/blogging-award-fun/. Keep up the good work man! Thanks for the mention, and your comment! Pingback: The Manchurian Candidate (2004) | Did You See That One? Pingback: Jack Reacher: Never Go Back | Did You See That One? Pingback: American Assassin | Did You See That One?